Le champ de bataille de Waterloo, la fin de l’épopée napoléonienne is part of the Tentative list of Belgium in order to qualify for inclusion in the World Heritage List. With no less than 17 entries, the Belgian Tentative List keeps on providing opportunities for rewarding day trips from my home. So this Saturday I drove just south of Brussels to a spot near the town of Waterloo, famous for the eponymous battle of 1815. 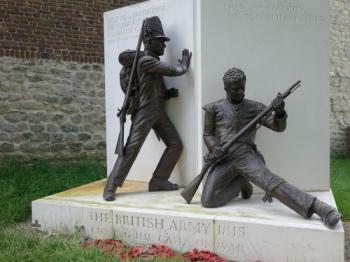 It is actually home to two TWHS: the Battlefield of Waterloo and the Panorama of the Battle of Waterloo. Both nowadays are located on the grounds of the Mémorial 1815. I arrived at 9.30 in the morning, right at the opening hour. The large car park already held some 20 cars and a bus. I had been wondering whether this is a busy site, but it turned out that I was the first visitor of the day. The other vehicles must have belonged to the staff and the ‘actors’ that carry out the reenactments which spice up the visitor experience during summer days. For a long time the Waterloo Battlefield and its huge Lion’s Mound had been a popular but not all that interesting destination for school trips. However, the bicentennial of the battle (in 2015) lead to a modernization of the site. An underground exhibition has been built, and the farmhouse of Hougoumont – where an important episode of the Battle took place - has been fully restored. They’re probably still paying the bills, as the entrance fee is a hefty 17 EUR. The fee does include an audio guide, which leads you through an underground exhibition. It does tell the historical circumstances of the Battle, shows the uniforms and arms used and the aftermath. You’d need to be a real militairy history buff though to enjoy the recommended 2 hours of the tour. The back exit brings you to the second ‘attraction’ of the complex. It is the Panorama of the Battle of Waterloo, a TWHS in its own right. The Panorama is a cylindrical painting, dating from 1912. It contains 14 canvases with battle scenes. Physical elements in front of the painting, such as cut-out figures, add some extra drama. The painting fits within the panorama-hype of the late 19th and early 20th century, and is one of the few surviving ones. There’s a famous Panorama in the Netherlands too (Panorama Mesdag near The Hague) which has been discussed for the Dutch Tentative List. Though being the oldest in the world, submission was rejected because of the ‘scale’ of the site. Next door stands the huge Lion’s Mound: a conical artificial hill, built on the orders of King William I of the Netherlands. Just as the Agricultural Pauper Colonies that I visited a few weeks ago, this monument dates from the short era when the Netherlands and Belgium formed one country (its people are strangely named ‘Dutch Belgians’ in the exhibition texts). Right at this spot, the King was hit by a musket ball during the Battle of Waterloo and fell of his horse. The mound can be climbed via 226 steps. At the top there are unobstructed views of the former battlefield, now mostly farmlands. The last part of the sights included in the entrance ticket lies a few kilometres away. A free shuttle bus ferries the visitors between the locations every half hour (you can reach it by car too, but there is nowhere to park). The Farm of Hougoumont was one of the first places where Napoleon’s French encountered the Allied forces. It is associated with some heroical acts. Since 2015 this is also a museum, a more atmospheric one than the underground exhibition at the main site. Not to be missed during a visit. The Mémorial 1815 site overall gets mixed reviews on Tripadvisor for example, but the general opinion is that the 2015 relaunch is an improvement from before. I enjoyed my 3 hours at the site, as a glimpse into a short historical period frozen in time. However I don’t think it will ever become a WHS: the Belgians still have the WWI memorials waiting, a similar site but with much more emotions still attached. Interesting for a sunny day trip. Highlights were the lion mound and the panoramic museum but I don't think this site deserves WH status.